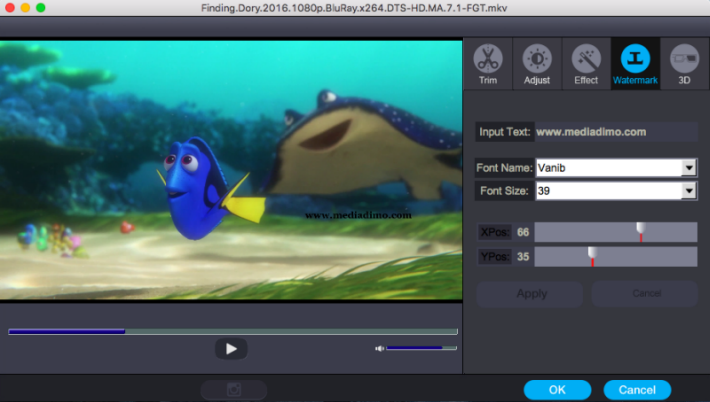 Dimo Video Converter Ultimate for Mac is a smart video converting/editing/playing/sharing application that you can say goodbye to all multimedia issues on Mac. It is available both in the paid and trial version. Step 1. 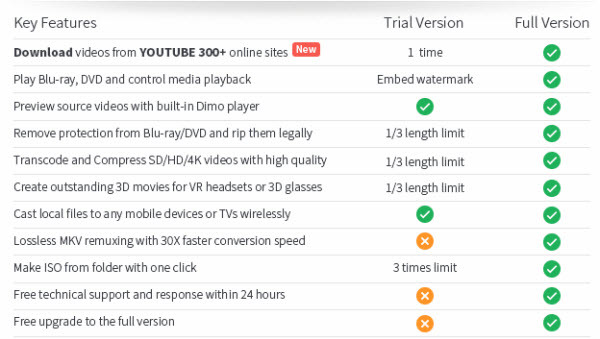 Search for your favorite video/movies/films from YouTube, Dailymotion, Vimeo and other 300 online video sites. Copy its URL by "Command + C". Then Launch the online video downloader, turn to "Download" tab, and "Command + V" to paste the URL to the address bar of the downloader. Step 2. Set a destination folder to store the downloaded video. And click "+" button to start downloading any favorite video to the hard drive. After several minutes, the downloading process will be finished, click "Open" button, you can watch the video on your desktop. a. 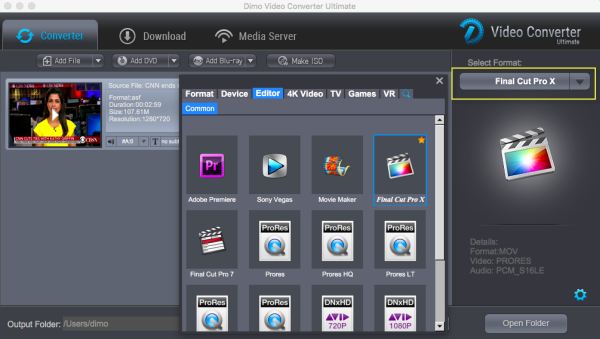 Double click the program icon to start Dimo Video Converter Ultimate for Mac. Please click "Converter" tab, you can convert Blu-ray, DVDs, video and audio to nearly any format. c. Select your output format in the right box. All formats are grouped into 7 categories and all devices are grouped into 9 categories. Find your desired output format or device. By choosing an audio format, you extract only the audio track from the video, or convert audio files from one format to another. d. You can also click "Settings" to change the format parameter like code, resolution, bitrate, etc. of output files. And appoint the output storing route by clicking the "..." at the bottom box of "Open Folder". Or you could skip this step to leave it default. e. After the settings are completed, simply click the "Start" button of task and the program will complete soon. You'll see the status changed below the item bar. When done, open the converted files by clicking "Open" or "Open Folder" at the downright box. 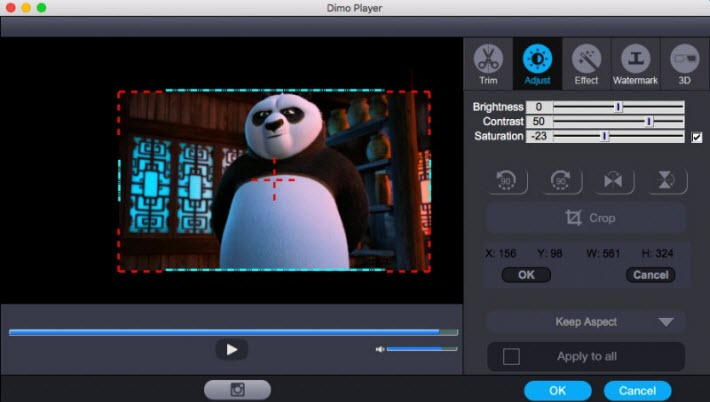 Dimo Video Converter Ultimate for Mac provides you with all regular video editing tools so you can enhance and individualize your video before conversion. Open Video Editing Window: Click the "Edit" icon of the video item bar and a video editing window will show up as below. Thus you can trim, flip, adjust brightnes/contrast/saturation, add effects and watermark with ease. a. 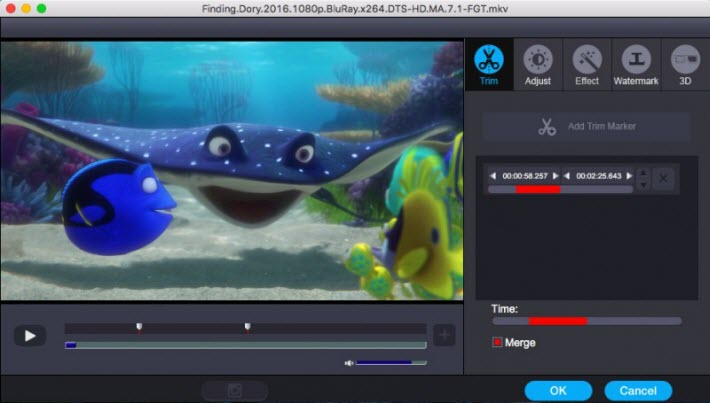 Trim Video: Go to Edit > Trim to open the editing windows. Click the Play button to preview your video and at the position you want to trim. Drag the markers to adjust segment duration. Then click "Add Trim Maker". Just click "+" to add more cutting segments that is helpful for you to divide a file into serveral segments, if you don't need merge the cutting clips into one file, please click "Merge" to undo parts joinning work or vice versa. You are allowed to adjust the "Start point" and "End point" in more acurate way by seconds by inputing time from its task bar at the right panel. b. Crop Video: Click Edit button on the main interface, then tap the "Adjust" button. As you can see in the above window, there are 4 rotating buttons in a row. Click each to rotate or flip video instantly. Or click crop to adjust frame size in desired aspect ratio to fit your devices. Other adjusting options will appear as well, including Contrast, Saturation, Brightness, etc. You can check to activate to adjusting function and directly drag the progress bar to get the effect you need. And you are able to preview the original and modified video in the preview area in real time. c. Apply Effects: Go to Effect tab to choose from 32 effect to tune up your video. Simply click an effect to apply. d. Add Text Watermark: You can add watermark in the text tab, where you can write an external character watermark to put on the video. e. Add 3D Effect: As you see the "3D" tap, you could add "Red-Blue", "Top Bottom", or "Left-Right" to create 3D effect. 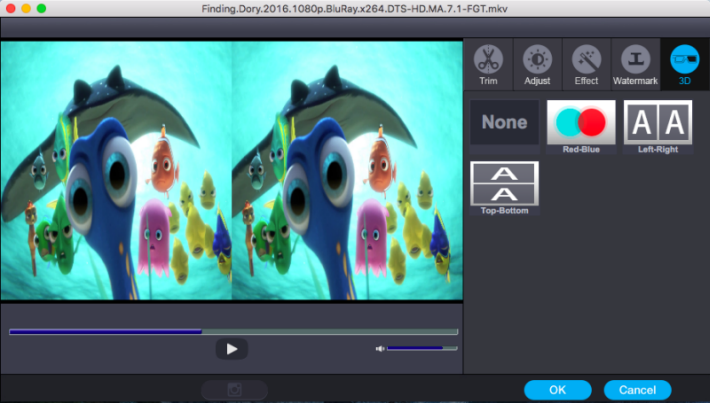 a. Click "Make ISO" and locate your source video/audio folder or Blu-ray. b. Click "Start" to create ISO.